My name is Jessica Prestage, I’m 18 years old and I am from England. I have just completed a four-week volunteering programme in Borneo. I finished school in May and I am starting university in September. During this break, I wanted to make the most of my long summer holiday by volunteering somewhere new that would allow me to learn about a different country and the conservation systems there. 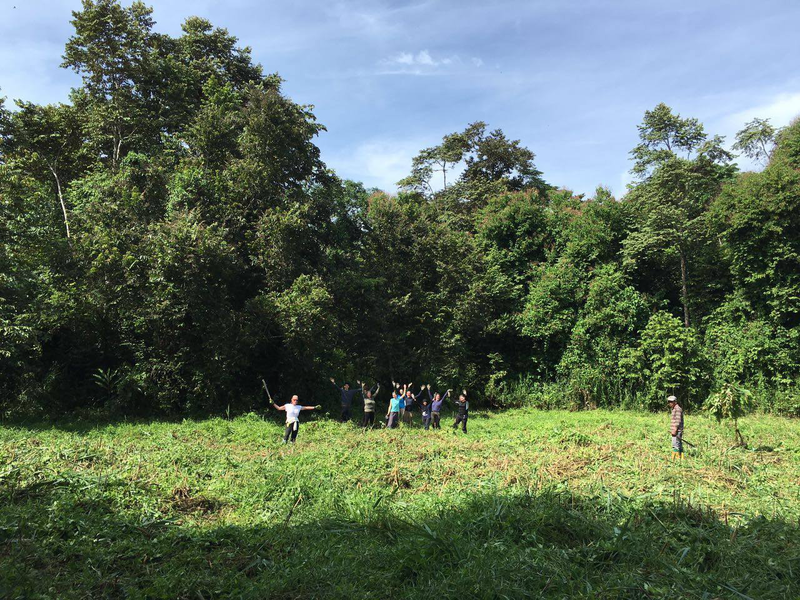 I looked at the opportunities available with Oyster; two projects caught my eye immediately – sun bear conservation and rainforest conservation in Borneo. 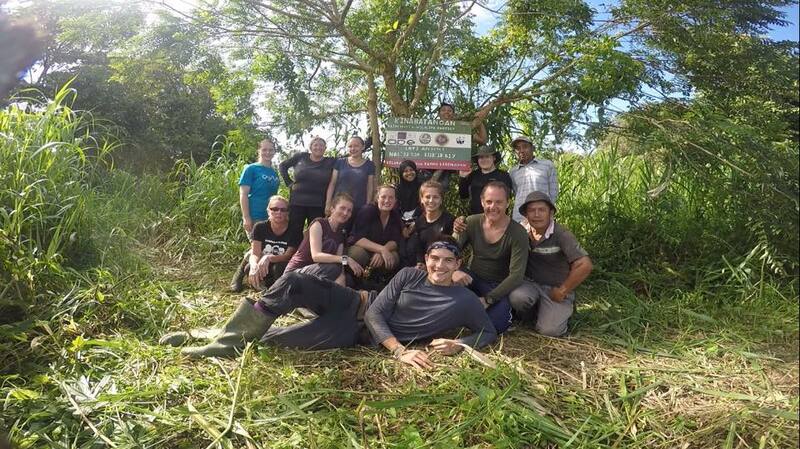 I spent the first two weeks volunteering with sun bears, and the second fortnight was spent at the Kinabatangan river in a small village called Sukau. I was working in a team of 10 volunteers assisting with worthwhile conservation projects. Along the river bank, there are large sections of land that are lacking in trees. This has negative impacts on the wildlife, namely primates and orangutans; when they are travelling along the riverbank, the lack of trees forces them to return to ground level to reach the trees further along. This increases the risk of being hurt or killed by poachers or other animals. We were working to reduce the amount of these sections along the riverbank to promote the use of the river as a feeding ground and safety for all animals. The project was split in order to allow us a break in between working days. The first two days were spent clearing weeds from around trees that had been planted a few months ago. These trees had grown to a few metres and taller, but were still vulnerable to strangling weeds and animals. Using machetes, we removed the weeds from the trees and cleared a circle around the base to prevent other weeds from growing in the near future. When on site, we worked from 7.30am to 10.30am, in order to avoid the hottest part of the day. By 10am on day 3, we had finished clearing the plot. Day 4 was a jungle trek to explore the forest along the river. 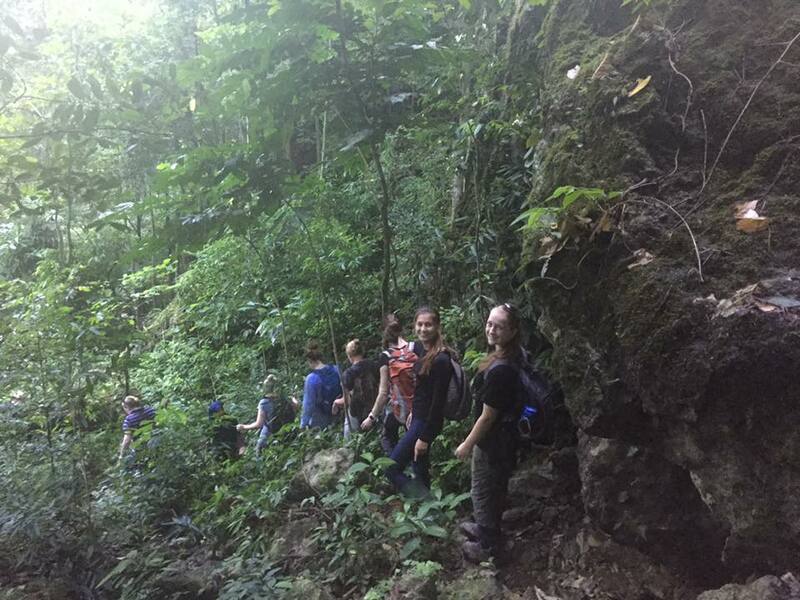 We hiked through primary rainforest and saw lots of species of trees, several animals – including a monitor lizard and a gibbon – and found a cave, which is home to a few thousand bats,. This was amazing as we were able to see the rainforest as it was before human interference. 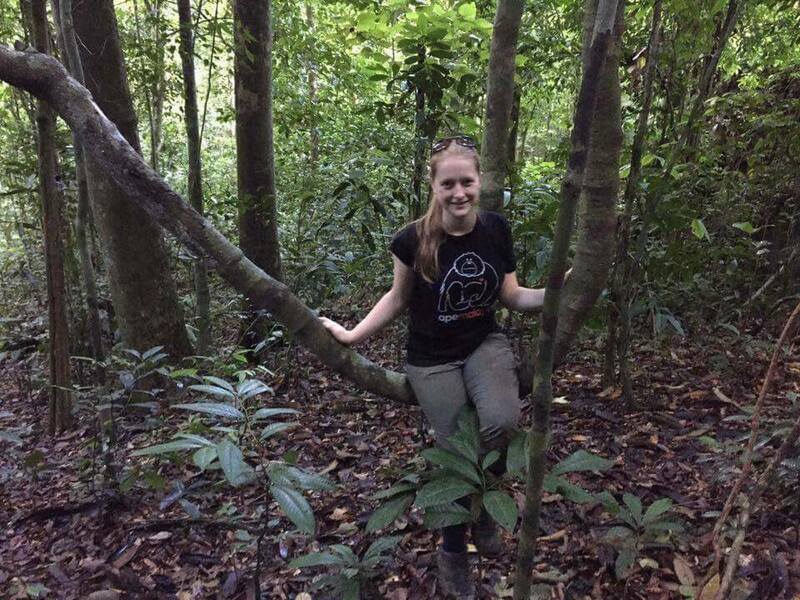 The primary rainforest trees were extremely tall and straight, with roots that rose out of the ground by two meters and provided habitats for all sorts of small animals (mainly bugs). A great experience! The next day was spent with the community; we learned some of the traditional dances from Sukau, taught some to the local children including the Hokey Cokey, the Macarena and YMCA. 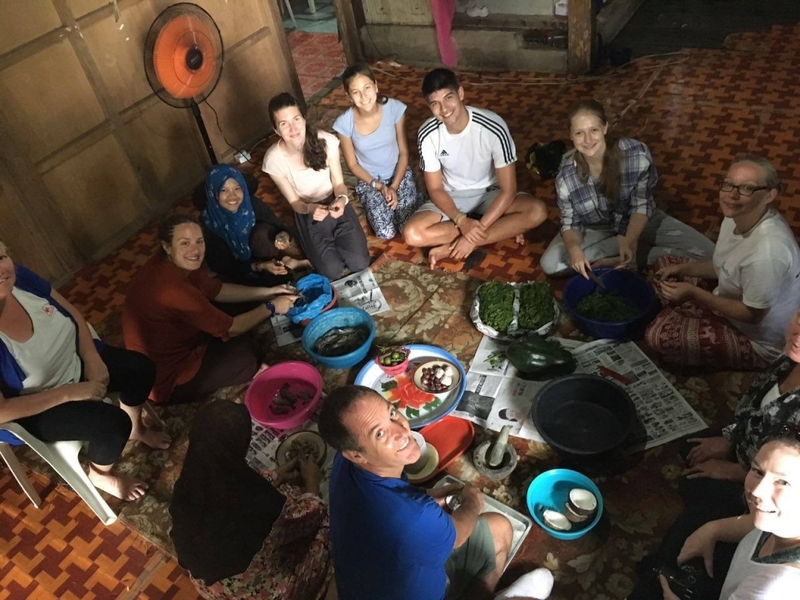 We also had a cooking lesson, involving shrimp, pumpkin, jungle ferns and coconut. We remained optimistic and the result was surprisingly delicious! We ate at three different houses during our stay in Sukau, and each of the ladies in the houses cooked for us. We received a wide variety of dishes to accompany rice and as a vegetarian I was pleasantly surprised by the range and quality of vegetarian dishes provided for us. On day 6, we were back on site. As we had left the plot for two days, during which there was a lot of rain and sun, the vegetation that we had cut down had shrivelled and flattened. This meant it was easier for us to clear a space around the stakes which had been put in place for us. This allowed us to return over the next two days to plant the saplings, one at each stake. In total, we planted 250 trees on our plot. Therefore, no other volunteer group needed to return to finish the work, as the plot was started and completed by my team. The mornings were spent on site, but the afternoons were spent out on the river. 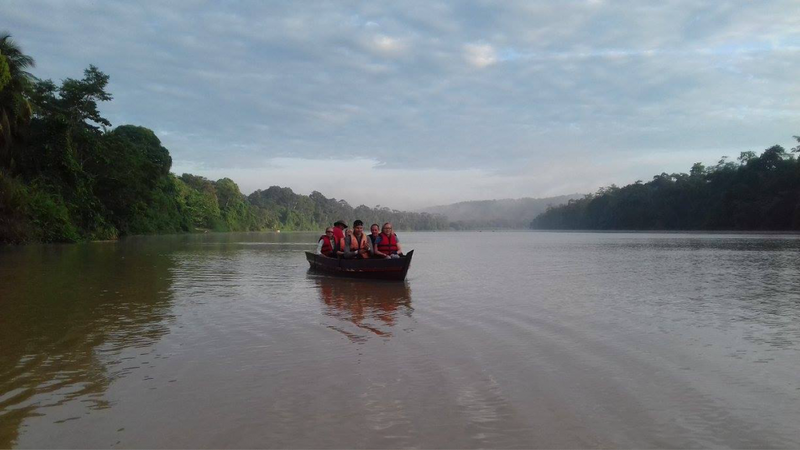 We all went out on the boat to do wildlife observation; this was when we saw the largest number of primates and orangutans. We were lucky enough to see 12 orangutans in total, including one adult male and one baby with its mother. One even made her nest directly opposite our accommodation, just on the other side of the river! We also saw many species of primates, including proboscis monkeys, short and long tailed macaques, silver and red leaf monkeys And a morph silver leaf. This means that it was a different colour to the others; when silver leaf monkeys are born, they have orange hair, like an orangutan. Around the age of two, they become grey. However, some remain orange; these are the morphs. Other animal sightings included snakes, lizards, civets and alligators. We were incredibly lucky to see this many wild animals, despite the lack of pygmy elephants. We heard reports that they were upstream but we did not have enough time to travel far enough to see them. My time at this project was fantastic, as I learnt a lot about conservation and the biodiversity in rainforests, mainly from Mark. He could answer any question we threw at him! Working as a team we got on really well and made a large contribution to the project as we completed an entire plot. It was a culture shock, coming back to the UK, but I will never forget my adventures and I would love to go back to see the progress that has been made at both projects. If you would like to volunteer with wildlife in Borneo, have a look at our project page .